I never appreciated the variety and loveliness of eggs until our hens started to lay. I keep waiting for a green egg. One young Ameraucana survived the recent massacre, but she has yet to pony up a green egg and we worry she may be one of the Ameraucanas that doesn't. At dusk the other day, I was putting the chickens to bed and this particular pullet stood on the rickety ramp up to the hen house, cocked her head, and, for a good long minute, peered at me sideways out of one glittering amber-colored eye. She has this heavily feathered brow that makes her look fierce and commanding, and standing there, gazing into the eye of this beautiful and elegant animal, I realized . . . well, I don't know what I realized except that for all the heartbreak, if we'd never gotten chickens I never would have known them for the funny, various, and mysterious creatures that they are. After everything that's happened in the last few weeks, it seems strange to go back to posting dowdy pictures of what I cook, but that's what I'm going to do. On Thursday, the night after my mother's memorial service, we held a subdued little party with my sister's family and my husband's parents, who had flown out from Boston. On the menu: Pioneer Woman enchiladas. I was deeply grateful not to have to chop a lot of vegetables, shop for exotic ingredients, or worry that children were going to complain -- the charm of all Pioneer Woman recipes. Filled with hamburger, canned olives, and canned chilies, then topped with canned sauce and shredded cheddar, these enchiladas were exactly like what you get on a combination plate in a Mexican-American restaurant that serves frozen raspberry margaritas and fried ice cream. I remarked on this, perhaps in a slightly sour way. "But Mom," said Isabel, "that's a good thing." She's right, it was a good thing, a very good thing. It just wasn't an interesting thing. which is as restrained a dish as you'll find in the PW sweets repertoire. (Tasty. Recipe is here.) Anything Ree Drummond can frost, she will frost, but even she can't frost a cobbler. In regards to the eggs, we have 2 Americauna hens that are laying, and only one lays green eggs, and th eother lays a light peach almost beige looking egg, so be prepared to be dissapointed. Not all of them lay pretty green, blue or lavender eggs. welcome back to the kitchen, tipsy. you will find much comfort there--as well as sadness, i'm sure--but we'll find entertainment and comfort again as you recover. maybe that chicken was saying: "I'm still here. you're still here. you gonna do anything about those mutts?" Hang in there, Tipsy. We're thinking of you. Good for you, Tipsy, welcome back. 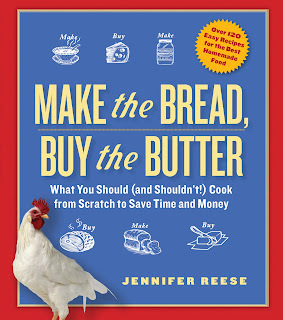 I'm glad you haven't given up your recipe postings, although your blog does contribute to my overspending on cookbooks. I've been lurking here long enough to feel I know your family, and was saddened to read of your mother's death. I am so sorry for your loss. So glad to see you back. I am sorry to say I remember well the "but what's the point?" feeling of doing almost everything previously normal after my mother died too. Pioneer Woman is probably a good place to stay for a little while. I'm not sure interesting is the best goal for the next few weeks, at least where the family cooking is concerned. Just a thought. Thinking of you and will be interested to see if any green eggs appear. The kitchen is a good place to heal, isn't it?